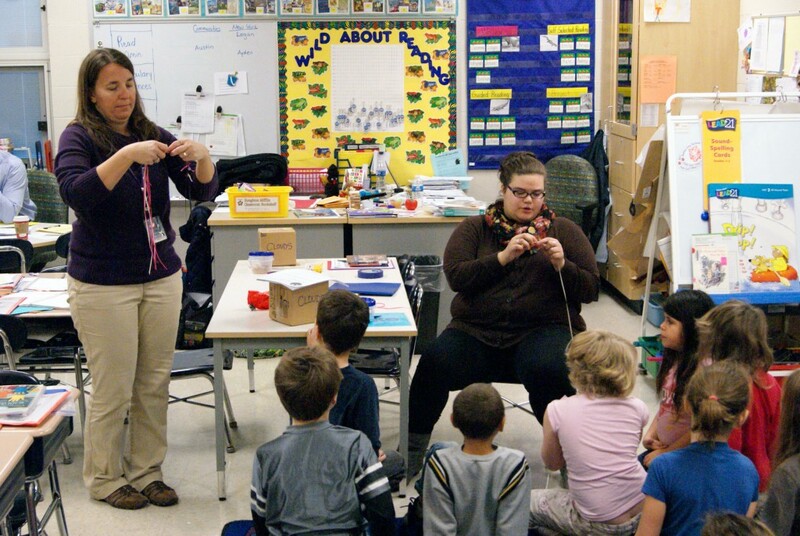 Nella Blackford, an Early Childhood Education major, gets field experience in a second grade classroom in Galion. Early Childhood Education students from The Ohio State University at Mansfield finished a field experience opportunity in December at the Galion Primary School. Twelve seniors spent the fall semester working with second grade teachers, gaining valuable field experience to help prepare them for student teaching. Ohio State students were also placed at the Primary and Middle Schools last school year. The students had such a positive experience in the Galion schools that Ohio State Mansfield Field Placement Coordinator Regina Sackman, a Galion alumna, knew she wanted to place as many students as possible in Galion. “Being a Galion graduate, naturally I wanted my students to experience and be a part of the quality education that Galion provides,” Sackman said. While in the field, the university students worked with classroom teachers to meet the needs of students, often working with individuals and small groups to reinforce learning. The student teachers were responsible for individual lessons, as well as peer teaching and assisting the classroom teachers. Galion second grade teachers volunteered to be mentors and to share their experiences. Heather Snow, a Clear Fork graduate, and Nella Blackford, a Mansfield St. Peter’s graduate, both taught Science and Social Studies lessons in Cindy Conner’s second grade class. “All the students in class were nice, worked very hard and were really patient,” Snow said. Field experiences provide opportunities for pre-service teachers to implement teaching strategies and theories that they learn about in their college course work. Working with students enables them to develop an understanding of how students learn and how to address each student’s specific learning needs. Posted by Christina Drain at 8:41pm March 5, 2015 Posted in Academics, Community. Bookmark the permalink.